Giving it lots more power is a good start. If you’re looking for an offroader, it doesn’t get much better than the Mercedes-Benz G63 AMG. It rolls off the production line with a 536-horsepower 5.5-liter twin-turbo V8, and its iconic, no-nonsense styling can’t be mistaken for anything else. Yet the aftermarket world is obsessed with upgrading the hi-po G-Wagon, with Germany’s mcchip-DKR the latest to provide some tasty additions. 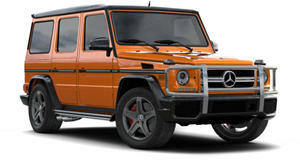 Dubbed the “mc800,” the upgrade kit for the G63 boosts output to a monstrous 810 hp and 700 lb-ft of torque. The kit is essentially made up of custom engine software, an upgraded turbocharger, steel conrod and turbo pipes and sports cats. Top speed is upped from 130 to 142 mph as a result. Other mods include an extra 150 mm of ground clearance and 120 mm more width, a set of 18-inch Beadlock alloys, and beefier brakes and suspension.